On October 7th 1998, a 21-year-old gay college student named Matthew Shepard was kidnapped from a bar in Laramie, Wyoming, savagely beaten and tied to a fence on the prairie, where he was left to die. It became one of the most infamous homophobic attacks in recent American history, and helped spawn a new generation of LGBT civil rights activists in the USA. 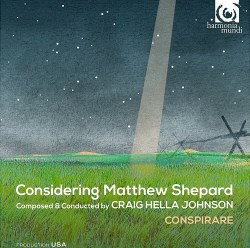 Craig Hella Johnson has worked with several writers to create this artistic response to the tragedy, a “fusion oratorio” which hits on a huge range of musical and literary influences to create something which I found really rather moving. Johnson writes helpfully in the notes about his musical inspirations. The work is structured with a three-movement prelude and epilogue, and the main central body is entitled Passion. The passions of Bach were a direct inspiration, both in terms of structure and mood, and Johnson even has the crowd of anti-gay protestors chant Kreuzige! repeatedly when describing the scenes outside Mathew’s funeral. There is a very wide range of musical influences on display, and Johnson tells us that this was intentional. The opening section has the musical feel about it of a Christmas Carol or a Broadway musical. Ordinary Boy, for example, the second track, introduces Matthew with bright optimism and a beautiful, slightly whimsical musical picture which some might find sickly sweet but which I found rather winning. In fact, I could imagine a group of twenty-something thespians acting it out as they danced around a stage to a scenic backdrop! From time to time I was also reminded of several film soundtracks (American Beauty’s spare piano accompaniment or Brokeback Mountain’s country-inspired style, for example), and Johnson even uses plainchant to depict the murder itself. Other influences include jazz (a very effective number to evoke the pain of those who grieved him), and there is a pointillist section that ask some searching questions about just how different we are to the murderers. Diverse as it is, it’s always tonal, and you’ll come away from it with lots of tunes, which is refreshing for a high-profile contemporary piece. Some might question whether the mood Johnson strikes is really appropriate for such sombre subject matter, but its great strength is to capture the sunny aspects of Matthew’s life as well as the darkness of the murder, and to explore the wider moral and even metaphysical issues that arise from the crime. Several details of the story are exploited for their poignancy – such as Matthew’s father’s eulogy for him at the trial, or the fact that a large deer appeared to have lain next to him on the night of the attack – and if it comes close to blatant emotional manipulation then at least it’s done beautifully and fairly openly. I’ve long admired Johnson’s work with Conspirare, both in established repertoire and relatively new work, and they give their all to this piece. That’s surely because they are moved by the cause but also, I'm certain, because they are responding to the creative impetus of their director, and it helps that their diction is impeccable throughout. The notes don't make it explicit, but I’m sure they must have given the premiere, and Harmonia Mundi have also done themselves proud by deciding that the work was worthy of a recording. I agree with them. Some will find it too saccharine, but I found it musically, artistically and spiritually very successful, and I recommend it. Explaining Johnson’s decision to work in a wide range of styles, the notes say that he “works with the fundamental connections (rather than differences) between diverse musical traditions, reminding us of our essential connectedness.” In a world like ours, we could all do with some more of that.